In 2015, an estimated 15.1% (36.5 million) U.S. adults were current* cigarette smokers. Of these, 75.7% (27.6 million) smoked every day, and 24.3% (8.9 million) smoked some days. The Centers for Disease Control and Prevention (CDC) is continuing its national tobacco education campaign—Tips From Former Smokers (Tips)—with hard-hitting TV commercials that feature real people who have experienced the harms caused by smoking. The campaign ads, which will air beginning January 2017, will again highlight the immediate and long-term damage caused by smoking, and encourage smokers to quit. CDC launched the first Tips™ campaign in 2012 to lower smoking rates and save lives, and the campaign has been very successful since then. Results of a CDC study published in the medical journal, The Lancet, show that in 2012 an estimated 1.64 million smokers tried to quit during the 2012 campaign period, and about 100,000 of them quit for good. After the launch of the nine-week long 2014 campaign, 1.83 million smokers attempted to quit smoking and an estimated 104,000 quit smoking for good. Americans pay a high price in illnesses and deaths due to tobacco use. Unfortunately, even though smoking rates have declined over the years—from 20.9% in 2005 to 15.1% in 2015—tobacco use still results in far too many deaths, disabilities, and smoking-related illnesses in the United States. For every person who dies because of smoking, at least 30 people live with a serious smoking-related illness. For more information about the Tips™ campaign and resources for quitting smoking, visit CDC.gov/tips. For help quitting, call 1-800-QUIT-NOW. More than 7 million deaths from tobacco use every year, a figure that is predicted to grow to more than 8 million a year by 2030 without intensified action. 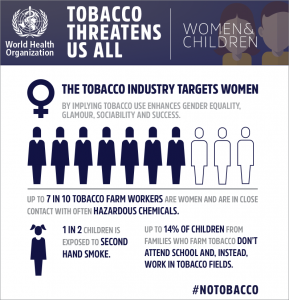 Tobacco use is a threat to any person, regardless of gender, age, race, cultural or educational background. It brings suffering, disease, and death, impoverishing families and national economies. Tobacco growing requires large amounts of pesticides and fertilizers, which can be toxic and pollute water supplies. Each year, tobacco growing uses millions of acres of land, resulting in global deforestation between 2% and 4%. Tobacco manufacturing also produces over 2 million tons of solid waste.